It was a great day of "Live from Space" on the National Geographic Channel, a live two-hour TV event by National Geographic and NASA to showcase what life really is like when for astronauts in space. 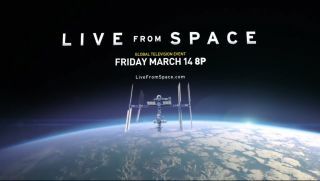 The unprecedented live show, which airs tonight (March 14) at 8 p.m. ET/5 p.m. PT, aims to bring space down to Earth for viewers like never before. Live From Space' host Soledad O'Brien would fly to the International Space Station if given the chance. See the exclusive video here. Track the International Space Station and learn more about Earth while counting down to the 'Live From Space,' TV event set to air on at 8 p.m. EDT tonight (March 14). NASA and the National Geographic Channel is about to take one giant leap for cable kind tonight with 'Live From Space,' unprecedented TV event to share the wonder —and drama — of space travel like never before. Space history will be made on Friday, March 14 and it will be broadcast 'Live From Space' for the world to watch. How NASA and National Geographic will transport you up. These days, Earthlings are to get pictures directly from the International Space Station. This will be highlighted in a National Geographic special Friday (March 14). Astronauts adore looking at the Earth. In recent years, we've been lucky enough to have astronauts sharing their amazing views of our planet on Twitter, Facebook and other forms of social media. Here are some amazing views from Expedition 38 and 39. NASA uses a constellation of satellites to beam information to and from the International Space Station. National Geographic Channel's 'Live from Space' program is expected to show amazing views of Earth during conversations with the astronauts on the orbiting outpost. The TV show 'Live from Space' will follow two astronauts on the International Space Station as they describe living and working in space. TV-viewers around the world will be treated to a live tour of the $100 billion International Space Station next month when the National Geographic Channel airs a two-hour special from the astronauts' orbiting outpost.